Raffi Hovannisian, the official runner-up in the February 18 presidential election, gathered his supporters in Yerevan’s central Liberty Square late Tuesday afternoon to declare himself the rightful winner of the election and suggesting that the officially declared president-elect, Serzh Sargsyan, concede his defeat. The opposition candidate did not elaborate on what those steps might be. According to the preliminary results of the Monday ballot announced by the Central Election Commission earlier today President Sargsyan polled around 59 percent of the vote, while Hovannisian gained the support of close to 37 percent of Armenian voters. Hovannisian, however, stated today that the election was rigged with “widespread fraud” and that he was the real “elected president”. “It is clear to everyone that the Armenian people gained an 80 to 20 victory yesterday, it has celebrated and will make a reality our national civil victory. No one will take this victory from our conscience, voice and our constitutional right. It belongs not to Raffi or Serzh, or others, but it belongs to the Armenians, to all of our citizens, and let no one, whatever his name or position is, dare take this right away from our people,” emphasized Hovannisian. 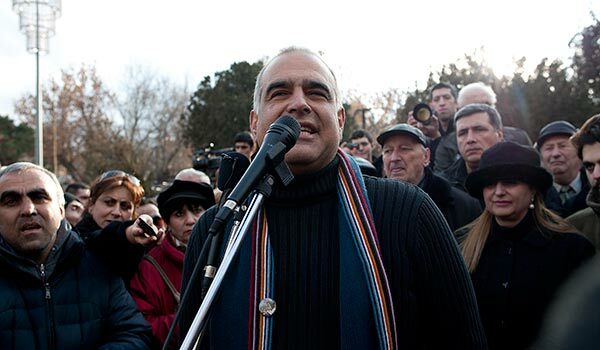 Supporters and activists who came to the meeting with Hovannisian – their number reaching some 3,000 – occasionally chanted “Raffi President” or “Raffi, Elected President”. Mostly middle-aged and elderly people were attending the rally, although there were also young supporters among the participants. Speaking about the violations that took place during the election, Hovannisian said that they were occurring everywhere and that eventually it proved to be a rigged and unfair election, failing to reflect the will of the people. Meanwhile, international observers who monitored the Armenian elections said on Tuesday that the “serious” violations observed by them could not have affected the overall outcome. “I want to shake hands with Sargsyan and tomorrow, before 5 pm, accept his congratulations on the victory of the Armenian people,” said the Heritage Party leader. Hovannisian also declared that he was ready to cooperate with all political forces in forming a future government. “All can become forces participating in the future legitimate government of national accord. I reckon that the time for partisanship has gone and civil society and political forces must come and participate not in the future government, but must become a factor of public governance. For five years there will be Heritage, Dashnaktsutyun, the Armenian National Congress, Prosperous Armenia, the Republicans and mostly non-partisan names, who will serve. But if they deviate from the letter of the law, do business at the expense of people, they will have to answer for that,” said Hovannisian.